This painted tin handcrafted folk art cross has a story hand painted in Spanish. These Mexican crosses are a perfect addition to any room in your southwest or Mexican hacienda style home. These items can be displayed in a traditional home altar, or given as a special religious gift. Available Assortment: Your cross will be chosen from our available assortment of colors and stories. 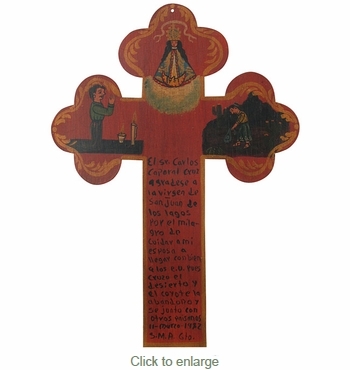 The retablo cross you receive will likely be different than the one pictured.